Terrain Dangerous mountains and cliffs, heavy woods, some swamplands. The Southmount is a cluster of rugged mountains and foreboding woods inhabited by monsterous things. 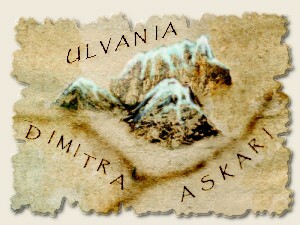 Though technically within the provincial boundaries of Ulvania, the area currently lies unclaimed by humans. Rumours from before The Catacylsm tell of a splendid city hidden within the Southmount's cliffs. Many times, adventuring parties have gone into the Southmount with wide-eyed dreams of glory and riches, only to return sobered, poorer, and fewer in number -- if at all. Since the Southmount has no strategic military importance to Askari or Ulvania in regards to their relations (the Shilo Steppe is a far more direct and securable alternative should war ever break out between the two provinces), both governments have avoided serious attempts to tame the monsters therein. However, the Dimitra military considers the Southmount an important defensible position and would like nothing more than to return it to human hands -- especially if those hands prove to be their own. It is likely they have the army to do just this, but crossing the provincial border in any official capacity has proven too difficult a political hurdle.